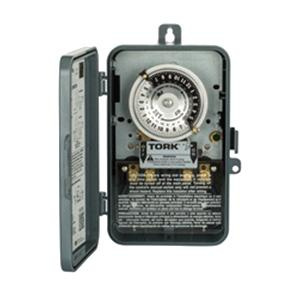 NSI Tork® 1100 Series 1-Pole Mechanical time switch has voltage rating of 120-Volts and current or contact rating of 40-Amps at 60-Hz. It measures 8.312-Inch x 5.062-Inch x 3.062-Inch. It accommodates conductor of size 8 - 14-AWG. Dial accepts up to 12 pairs of trippers. It features polycarbonate outdoor with clear cover. It consumes 3-Watt power. This switch with SPST contact configuration, has time range of 24 hours. It withstands temperature range of -40 to 74 deg C. Switch is suitable for lighting, pumps, signs, fans, air conditioning, water heaters, automatic ON/OFF control when operation is required at the same time every day. Mechanical time switch is cULus listed.